We get many calls and emails from frustrated listeners and readers trying to find organic products. Most garden retailers are not carrying natural organic products, especially the state of the art products that we have researched and found to be the best. Great products are available and work better in every way. We need your help in getting the retailers to push the chemicals aside to make room for natural organic products. 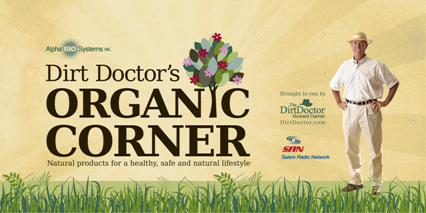 We can help in establishing a Dirt Doctor's Organic Corner at your favorite retailer by providing the graphics and the retail set up. Ask the retailers where you live to provide natural organic products for a healthy, safe and natural lifestyle. Other great natural organic products in our staple recommendation include: Cat Scram, Deer Scram, Dr. Ohhira’s Probiotics, Lady Bug Natural gardening products, Medina, Mole Scram, Muenster Natural, Nature's Guide, Scram for Dogs, Texas Olive Ranch Olive Oil and Zeotech zeolite.